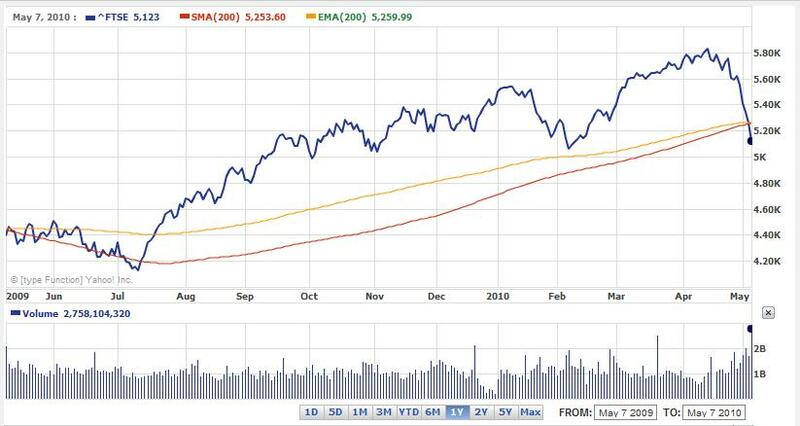 A search online for the 200 day moving average or simple moving average (200 dma or 200 sma) will reveal many hits and a lot of different opinions. 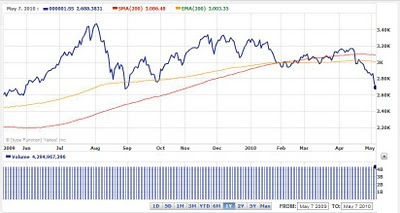 Firstly what is the 200 dma? 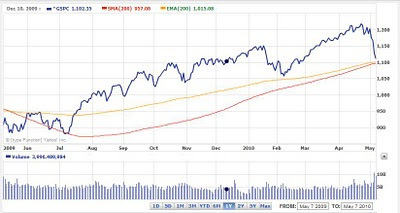 In its simplest form it is the average of a markets closing price over a 200 day period. To construct the average you add the last 200 days closing prices and divide by 200. 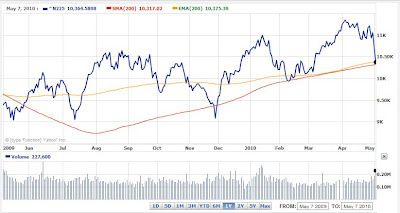 Another form is the 200 day exponential moving average (200 ema) which is a little more complex and provides more weight to young price data and less weight to old price data. There are some basic suggestions that the 200 dma is a line that can help you tell when we are in a bull or bear market. 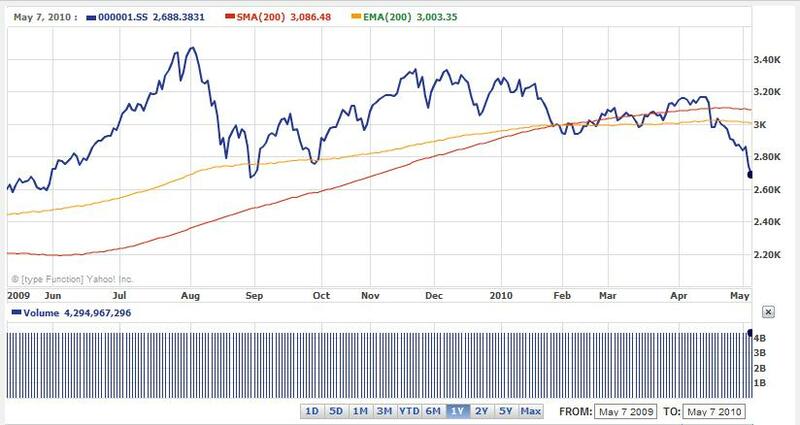 For example if the market goes from below the 200 dma to close above it then we may be in a bull market and similarly when the 200 dma goes from above the 200 dma to close below it then we may be in a bear market. People then seem to build on this data by adding complexity from which they then trade on the indicators. Now I am not a Technical Analyst and don’t intend to become one. As regular readers will know I am very much from the school of thought that you pick your strategic asset allocation, rebalance regularly, minimise your fees, minimise your taxes and you will achieve a reasonable return. I’m obviously mixing it up a bit with some tactical asset allocation based on the cyclically adjusted PE (CAPE or PE10). 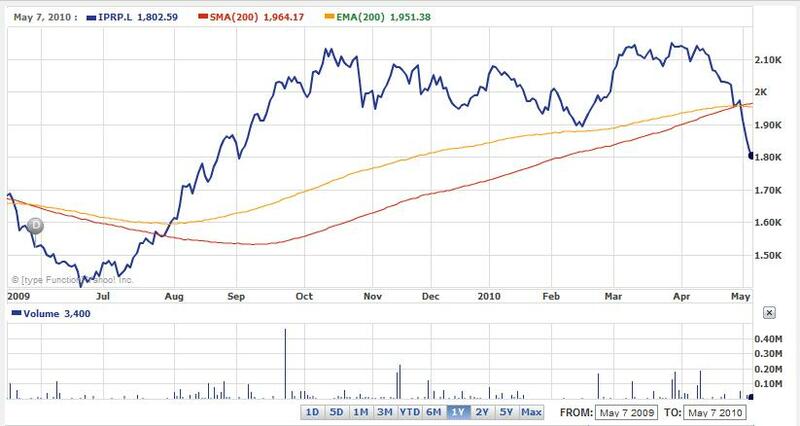 This is in my opinion is the ‘time in the market’ rather than ‘timing the market’ strategy and seems to be working well for me so far as my current performance is above a basic UK stocks and bonds allocation. Obviously I really won’t know if my strategy is successful for many many years however I’m currently happy. 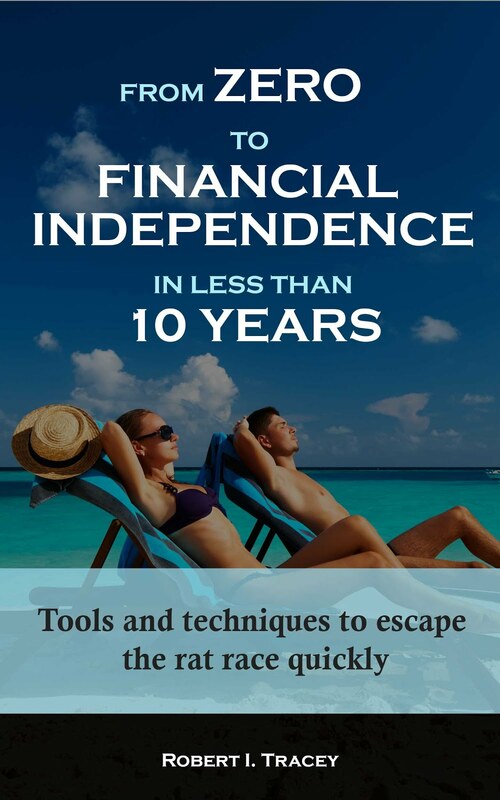 - In its simplest form Dr. Steve Sjuggerud wrote an article on the MoneyWeek website in 2008 (unfortunately it still doesn’t seem to be live on the internet) entitled ‘The simple way to tell if it’s safe to buy’. 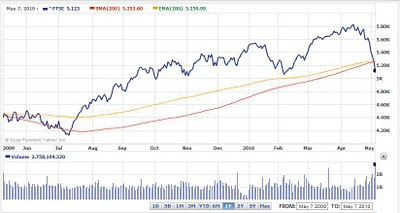 This article suggested buying and selling based on the 225 dma. I have no data either way whether this will work in the long term. I am however a believer in the ‘if it looks too good to be true then it probably is’ mantra. That would make me guess that it probably won’t and things like whipsaws could eat your portfolio alive. - An intermediate type of concept seems to be looking at when sma’s of different periods cross each other. 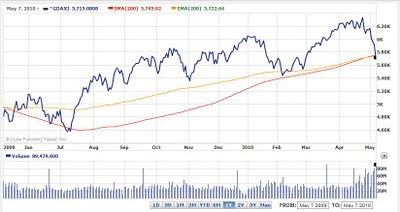 For example making trades based on when the 50 dma crosses the 200 dma. 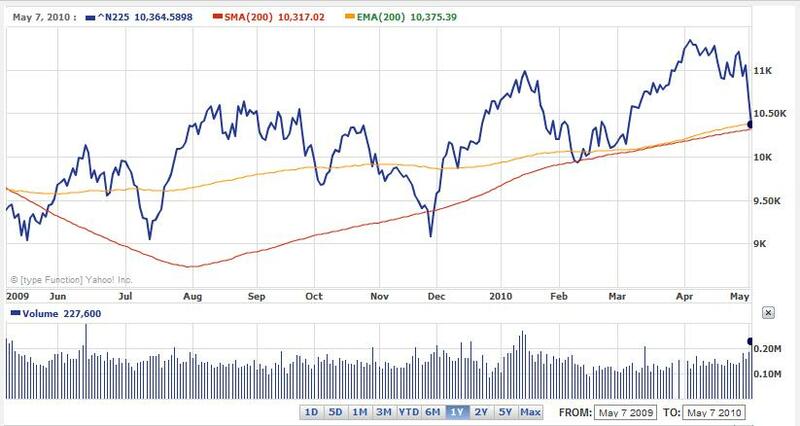 - The first chart today shows the Australian All Ordinaries (I hope a pseudo indicator of the ASX 200 which I couldn’t get a chart for) has now passed through the 200 dma and the 200 ema. Is this now a bear market? 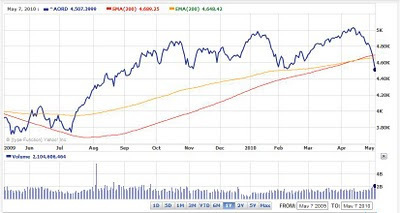 - The second chart shows the UK FTSE 100 (I hope a pseudo indicator of the FTSE All Share which I couldn’t get a chart for) has also now passed through the 200 dma and the 200 ema. Is this now a bear market? 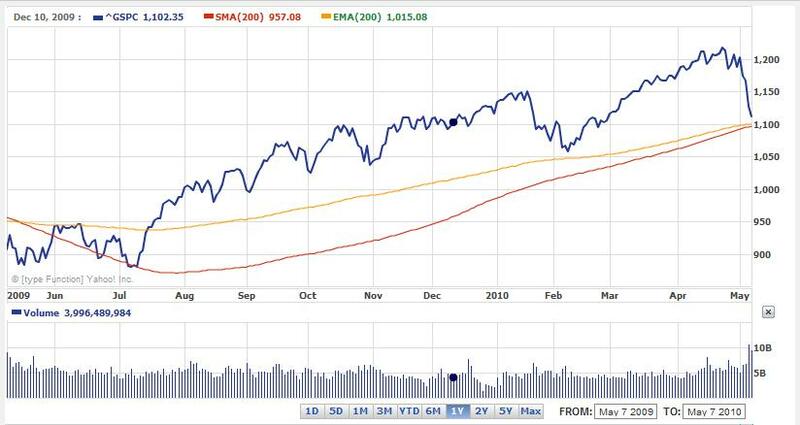 - The third chart shows the US S&P 500 is still above the 200 dma and the 200 ema. Is this still a bull market? - The fourth chart shows the German DAX (some of the stocks that will probably be part of my European ex UK holdings) has passed through both indicators. Is this a bear market? 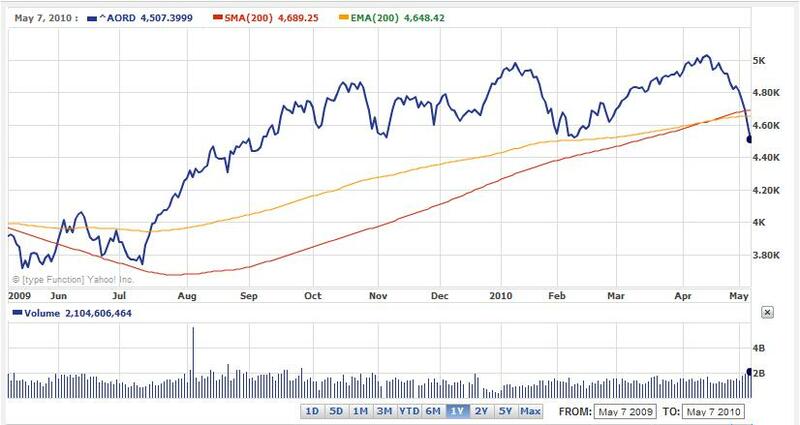 - The fifth chart shows the Japan Nikkei has passed through the ema but is still above the sma. Is this a bull or bear market? MoneyWeek still seems bullish on Japan as recent as this week. 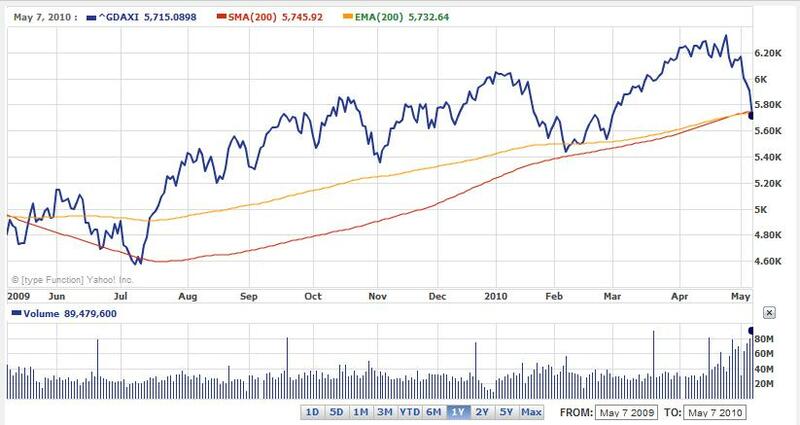 - The sixth chart shows the China Shanghai Composite (used as China is a significant holding in my Emerging Market fund) has passed through both indicators. Is this a bear market? 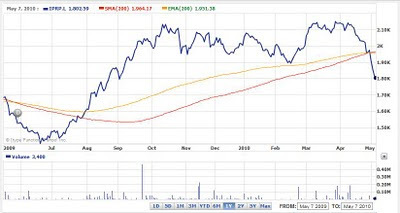 - The seventh chart shows IPRP which is the iShares FTSE/EPRA European Property Index Fund (note this is priced in GBP but the investments are mostly in EUR so there is exchange rate variations in this analysis also) has passed through both indicators. Is this a bear market? Of course I have absolutely no idea of the answers to any of these questions and I’d personally question anyone who did claim to know the answers. So why am I here writing about 200 day moving averages given that I have a portfolio constructed which I am happy with? Well one area where I still have a gap is when to rebalance my portfolio. Tim Hale’s great book “Smarter Investing : Simpler Decisions For Better Results” suggests ‘when your level 1 assets have changed by 10% or more.’ ‘An example of a sensible rebalancing strategy for say a 50 percent bond and 50 percent equity mix would be to allow the portfolio to run to 60 percent ... before rebalancing...’. I’ve also read a rule of thumb is to rebalance annually. Of course there are also plenty of other rules of thumb on the internet. I can’t help feeling that this is a bit unscientific and that maybe there might be something better out there to at least try. So what am I thinking? Well so far it’s not proving too difficult to rebalance. When dividends are paid I can reallocate these to other asset classes to rebalance. Additionally because I am investing quite large sums per month I can allocate new money to the worst performing asset class. However in the future as the portfolio grows larger I can’t see this continue to work. So I’m wondering if it might be possible to rebalance (rather than completely selling out) based on 200 day moving averages. As you can tell by the doubting tones of this post I’m not ready to make this decision yet and have a lot more research still to do before I even contemplate trying it. Until then Hales opinion and the 1 year rule of thumb is about as good as it gets for me. 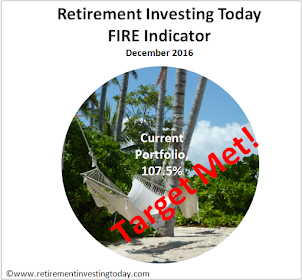 Disclosure: I hold IPRP within my Retirement Investing Low Charge Portfolio. Thanks for these very interesting charts. So much for the bears - the whipsaw effect seems to have hit most markets. Unfortunately no chance to get in today at last Friday's levels which were looking better value. at the price only on the first trading day of the new month. This strategy though (ignoring any dividends) still seems to under perform a buy and hold strategy over this period.